We stock trailers for classic wooden boats in various sizes from 17 ft on up. Can I Have it Varnished Before Mitch Delivers? Yes, if you allow for some lead time. The earlier you reserve your spot in the restoration shop, the better. We hope you will enjoy browsing the pictures of our classic boats for sale . 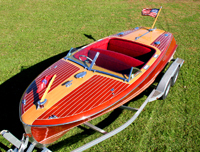 Here you will encounter exciting antique boats by Chris Craft, Hacker Craft, GarWood, Riva, Ventnor, Century and Stan Craft. You will no doubt notice that we no longer delete the "sold" boats, as they come in handy as a ready reference for hull style, instruments, deck hardware and all those details that go into identifying classic boats or obtaining correct parts. The newer boats are always near the top of the list for your convenience and the "sold" listings are clearly marked and moved further down. We own most of the classic boats we offer for sale, though we also serve as a classic boat broker, selling boats on commission for customers and friends. 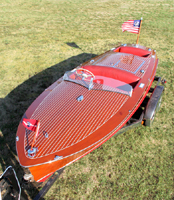 Most of our antique classic boats are eligible for a low cost credit union loan. Depending on which wooden boat you select from our collection, it may even be possible to include varnish, bottom paint, a new canvas cover and other extras. We offer complete classic boat restoration services including professional woodwork, refinishing, engine rebuilding, mechanical and electrical work. Check out the 25 ft Chris Craft Sportsman project boat at the left... One of the most desirable of the large utility models. Call to find out what would be involved with restoration. Please call ahead! Mitch travels a lot and has a serious golf addiction, so let us know when you are coming and we will be ready to greet you! Our classic boat showroom and restoration shop is located just 45 minutes west of the Minneapolis / St. Paul International Airport in the town of Glencoe. You will enjoy the pleasant drive through farm country on paved highway all the way. Our antique boats often sell before we have a chance to photograph them and get them on the web site, so please feel free to call and find out what's in stock. We are here 9 am to 5 pm central time Mon-Fri, but you can usually catch us after hours and on weekends as well. We recommend you sign up for the Email Alerts. Just type your email address into the box below. Each time we add a new listing to the web site, you will receive an email within minutes complete with a picture, description and price. Sometimes the really great classic boats will sell the same day they are listed, so the Email Alerts are a good way to stay in the loop. If you are thinking about buying your first classic wooden boat, you no doubt have lots of questions and we will be happy to answer. No question is too elementary, so give us a call any time. We will fill you in on the finer points of storage, maintenance and towing and navigating. 952-471-3300 (10 am - 5 pm central time, or later some days). Why Buy A Boat from A Classic Boat Dealer? 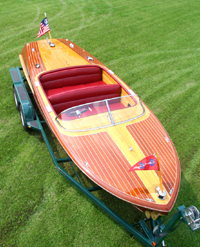 Our showroom has a wide assortment of antique and classic boats for you to compare. We offer lengths from 16 ft up to 38 feet and conditions range from project boat to show quality. Other advantages to working with a dealer and restorer include the option of having us paint a new name on your transom, provide a new custom trailer, a canvas cover, or change out the upholstery. We rebuild engines, do every kind of electrical and mechanical work in our restoration shop and we deliver! One of the first decisions you need to make is whether your needs are best met with a classic runabout or a utility model. Some folks are attracted to that sleek runabout look, while others gravitate to the family-friendly utilities, which are great for swimming and skiing. You will quickly discover that you can get more "stuff" in a utility, such as coolers, beach towels, swim toys, skiis and even the family dog. You may also appreciate the fact that on average , the utility models tend to cost a little less. First-time wooden boat owners sometimes go for the smallest speedboat they can find, assuming it will be easier to handle, but we generally recommend buying the largest classic wooden boat that will suit your purposes. You will notice a definate improvement in rough water performance for every added foot of length. Having said that, we must add that most wooden boats offer a smoother ride than fiberglass boats of the same length. Since we own our classic boats, the price of each boat is relative to the others. The higher priced boats are more desirable due to features, looks, rarity and condition. You will notice that our classic wooden boat inventory is priced with a high degree of consistency, relative to model and condition. The older listings have somewhat lower prices due the fact that collectible wooden boats have gained value over the years. Other web sites may list classic boats for many different owners, and you will see prices all over the board. This is because inexperienced sellers tend to look at each other's ads for pricing information. How often do you have to varnish classic boats? Well, that depends on how often you use them. Marine varnish has an ultra-violet absorber, but this chemical is used up when it reacts with sunlight, so eventually you need to apply more varnish. A good rule of thumb is that if you are using your classic boat every weekend during the summer, you will need to add 2-3 coats of varnish every 3 years. Fresh bottom paint is applied a bit more often, every one to two years. Most people hire out the bottom painting, as it involves lying on your back and wearing goggles. Antique boats require shelter from direct sunlight when not in use. We have about 100 Classic Chris Craft engines in stock, ready to rebuild and ship to your marina or mechanic. We will even take your old vintage engine on trade. We ship to the United States, Canada and Europe. We specialize in Chris Craft 6 cylinder Hercules engines and classic inboard V8 engines, including vintage Chevy 283 V8s. Call Mitch to sell your classic Chris Craft boat in any condition, he will pick it up anywhere in the continental USA, and pay you on the spot. In most cases, we prefer to buy your classic boat outright rather than consign it, but we do offer antique and classic boat broker services. Check out our Chris Craft Hull Numbers page to identify your Chris Craft antique boats by hull number, year manufactured, model name and length. Color photos included for identification purposes. Please call for directions to the showroom.